Hugo is a recent graduate from the University of California, Santa Barbara with a degree in History of Public Policy. Though he grew up in Fillmore, California, which is a small town east of Santa Barbara, Hugo and his family emigrated from Mexico when he was just a young boy. His family’s background in agricultural work and his exposure to their working conditions inspired Hugo to research more about migrant workers and his family’s history. The knowledge he gained about his family then developed into an interest and understanding of broader issues in his own community, both politically and culturally, which he hopes to learn more about through his work with the FUND. Hugo also has a passion for helping younger students pursue a higher education and is excited to join the FUND as South County Coordinator for the Youth Making Change program. 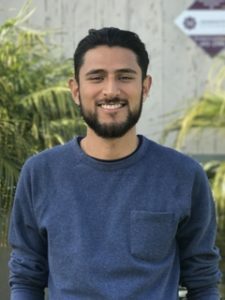 During his years at the university Hugo was part of the College Link Outreach Program, a program dedicated to helping underrepresented students from Los Angeles experience college through workshops, academic resources and professional connections. In his free time, he enjoys reading about philosophy and watching TED talk videos on YouTube.